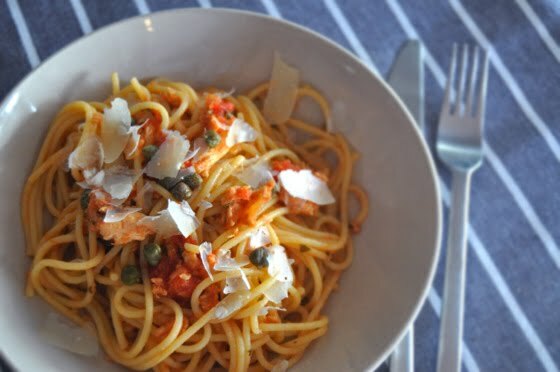 These are a very simple, loved and common spaghetti in my home. They are so easy to put together, it takes me literally less then 15 minutes form start to finish when we are ready to eat them. It helps of course that the base for the sauce is tomato ragout that I always have in my freezer!! When I still lived at home with my parents, we probably had five or so pasta recipes that we ate all the time, pasta is by far our favorite food. I remember they were the gnocchi or tortellini in creamy Gorgonzola sauce, spaghetti with tomato ragout, rigatoni with my moms stewed beef, spaghetti or linguine in creamy peppery sauce with bacon, and last but not the least, spaghetti puttanesca. All of these dishes are fast and delicious, and most of them (exception is stewed beef sauce) ready within minutes. I can't wait to share them all with you, starting with this recipe! If using a frozen tomato ragout, put it in the microwave for a few minutes to defrost, otherwise just prepare your ingredients and start boiling the water in a big pot. When boiling, salt it generously and put spaghetti in. Cook them al dente. On the side, saute onions in olive oil, but don't caramelize them. Add garlic to them for 30 second before adding the tomato ragout. Stir and add the tuna, capers and olive. Season with salt and pepper, oregano and crushed peppers. Add a little bit of the starchy boiling water to the sauce, stir and set aside. Drain the spaghetti and add to the puttanesca sauce. Stir well and serve on plates. Shave some fresh Parmigiano-Reggiano cheese on top and enjoy!